LITTLE CHANGES CAN MAKE A BIG DIFFERENCE. At times many of us feel that the world could have been a different place - a little brighter, maybe a little happier. But then these thoughts lay confined to the back of our mind as we juggle with our daily routine and responsibilities. Does that mean things will never change? 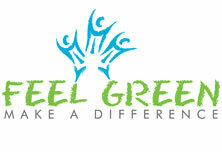 Feel Green is here to make some little changes. Did you know that if every Indian donates blood once in his life there will be no shortfall of blood in our country? Did you know that if we plant 30,000 trees in every state of India, then we could possibly reduce the effects of global warming? Do you know that if we invest more in agriculture then we can help save poor farmers and combat the global food crisis at the same time? And finally, do we believe that we can put a stop to terrorism and violence if we unite? We need to stand together to face the many changes that are taking place around us. We welcome everyone who hopes to shape this change to build a better future.